I would like to introduce to you Game Face Wipes. These come in four distinct types of wipes that will help men AND women become fresher, cleaner and more hygienic with each use. For years hygiene wipes have been a product almost exclusively dominated by the female demographic market, right? But studies have shown that men use hygiene wipes at almost a near equal rate, even though they do not have a brand identified with their gender. Game Face Wipes are designed to fill that void in the men's grooming department. Their goal is simple: Do one thing and do it well, but break the norms of an entire category to create a new narrative and original attitude. They want to evoke emotion about their brand to generate customer loyalty in lasting ways! Deodorizing Underarm and Body Wipes: The Deodorizing Wipes are perfect for a quick post-workout wipe down. They are made with a cleansing formula that kills odor and leaves the skin feeling clean & fresh. 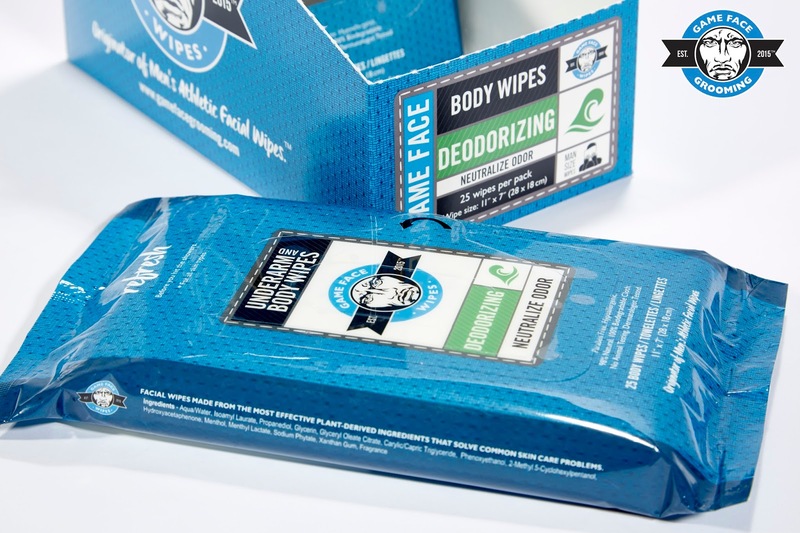 Game Face’s Deodorizing Wipes are perfect for those who work out a lot to keep themselves smelling fresh after a rigorous workout. 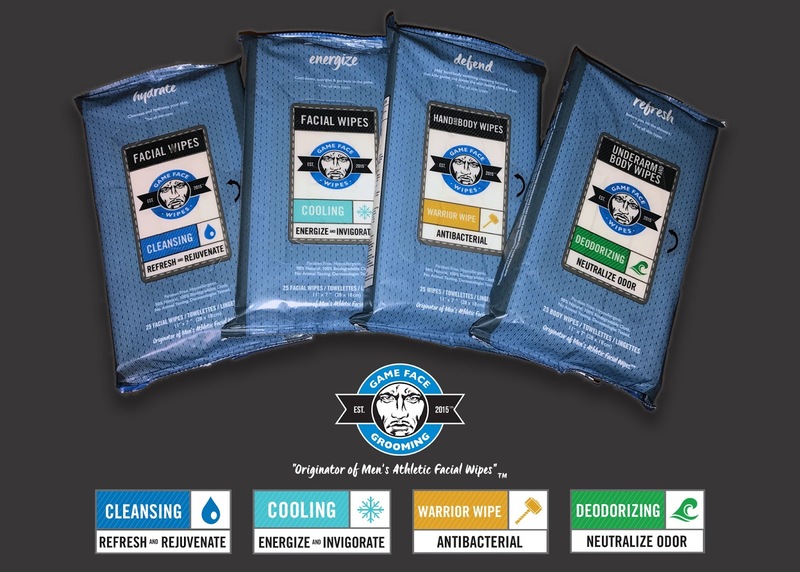 Anti-Bacterial "Warrior" Wipes: Their anti-bacterial “Warrior Wipes” are made with a mild hand/body sanitizing cleansing formula that kills germs and leaves the skin feeling clean & fresh. These eco-friendly wipes are perfect for people who work out to keep themselves free of MRSA and other staph based bacteria that are common in work out facilities. Cooling Facial Wipes: The line of “Cooling Wipes” (Energize & Invigorate) are specifically designed to keep you cool in the hottest of situations, wiping away sweat without leaving any trace of residue. Cool down, energize & get back in the game. Cleansing Facial Wipes: The "Cleansing Wipes" (Refresh & Rejuvenate) wipe away dirt, grime, and sweat while also hydrating the skin. These leave you clean, fresh and ready to go! All Game Face products are: paraben free, hypoallergenic, 98% natural, 100% biodegradable (TENCEL), dermatologist tested and made in the United States. I tried out the Deodorizing Wipes. To be honest, I did not think that they were going to be very useful. I thought how could they actually deodorize my skin as well as a deodorant and cleanse my skin too? Well they actually worked. Well. The wipes cleanse the skin and deodorize it so that it does not smell at all. I used them on my underarms, because they are for use on the Underarms and Body. I purposely did not use deodorant that day. I was surprised at how well the wipes cleansed my skin and left my underarms smelling like coconut. I love the coconut scent. It is refreshing and unisex. These are a great product and even though I am a woman, I think men would love these too. I gave one for my husband to try and he liked them too. He even liked the scent. What he liked the most what how refreshed he felt from the wipe. Game Face Wipes are available from www.gamefacegrooming.com, Walmart and GNC. Pick them up next time you are out and in need of some refreshment.